In 1895 there was disagreement between the SAAA and the SCU (Scottish Cyclists Union) about various topics but mainly about money and amateur status. Some of the clubs in the West of Scotland fell in with the SCU and formed a new organisation, the Scottish Amateur Athletic Union. This body held its own championships in parallel to the SAAA Championships in 1895 and in 1896 before the rift was healed. There may well be a page on the various rifts in Scottish athletics soon so we won’t go into the topic in detail here. In 1895 both national championships were held on the south side of Glasgow on the same day. The athletics public had the choice on Saturday, 22nd June of seeing the SAAA Championships at Ibrox with seven track events and four field events or going to Hampden to view the SAAU Championships which only had six track events. Why bother with the SAAU when there was more on offer across at Ibrox? Well there was some of the politics of the situation which would affect your choice but while Downer was going for his third triple, McIntosh was throwing and Hugh Barr competing in the Broad Jump, most of the Clydesdale Harriers and other west clubs were at the SAAU meeting and the midle distance events were promising greta things. The big result of the day however, had to be the 880 yards win of RS Langlands at Hampden when he recorded 1:59.8 – the first ever sub-2 minute half-mile in Scotland. He finished very strongly but alone after R Mitchell, the only other competitor dropped out. Many would say Downer’s third triple win including the 100 yards in 10 seconds which equalled the championship best, Scotttish record and Native Record would get top billing but there was a genuine debate to be had on the topic. In the results table below, the SAAA Results come in the first three columns while those of the SAAU are in the next three columns and in italics. How did the two championships compare? First financially, maybe not surprisingly the SAAU came out on top since it was held inconjunction with the SCU Championships. The ‘Glasgow Herald’ report read: “That cycling is an important factor in modern sport had another exemplification at Hampden Park last Saturday, when the SCU and its newest confrere the SAAU held their joint championships before a crowded attendance. 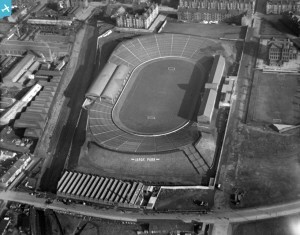 The actual drawings at the gate represented a paying crowd of 7000, while with the amount from the stands and that coming across from other sources, the total aggregate will not fall far short of £240, or almost the same sum as was netted at the Scottish Meet races at Powderhall the week before. It is evident that whatever party is pecuniarily affected it is certainly not the SCU, which is now more financially sound than it has been before. The same cannot be said of the SAAA which has lost money in all its meetings held in the West. These gatherings have been so sparsely attended that the surplus with which the SAAA started the season must now have almost entirely disappeared.” The comment after the short account of the SAAA event read: Any pleasure that was derived from the general excellence of the sport was greatly modified by the wretched response which the public made to the appeals of the SAAA for support. The drawings did not exceed £25, which is the smallest sum ever taken at a championship meeting in the city. One of the factor affecting the issue was the fact that Clydesdale Harriers, the largest club affiliated to the association had thrown its support behind the SAAU and the cyclists. Where the SAAA could provide what the SAAU could not (eg 10 miles track race, any field event) the CH members simply used the Association’s events. This paid off in international selections where the established and older body selected the teams. The top men in the country who competed at the Union championships, such as Langlands in the half-mile, Robertson in the Mile and Hannah in the Four Miles, were not chosen. The actual result was a win for Ireland who won 6 events to Scotland’s 5. Scottish winners being Downer in three events, Hugh Welsh in the Mile and D Ross in the Hammer. While not as important as in the twenty first century, the power to select international teams was probably one of the factors that brought the split to an end after only two separate championships. But the financial situation of the two organisations gave the other side a bargaining counter that was at least as persuasive. The split continued into 1896 and a journalist referred to “The SAAA (or Edinburgh as it largely was for the time being)…” and a look at the results shows that the west clubs made up most of the SAAU. Individuals such as Hugh Barr of Clydesdale competed in the east championships because they lived in Edinburgh, worked in Edinburgh and trained in Edinburgh. Individuals were not barred from competition because their club supported one camp of the other. Both groups had their championships on the same day – 27th June – the SAAA at Powderhall and the SAAU at Hampden. The crowd in Glasgow was estimated at 8000 when the meeting started at 3:00 pm but the only comment on the turnout in Edinburgh was that the meeting was enjoyed by a large gathering. The weather at each was said to be warm and sunny with light breezes. The first glaring omission is the name of AR Downer who had just completed a wonderful three years of competition and was clearly running well. The story is that he had been accused by the English AAA’s of professionalism, found guilty and a month later (26th July, 1896) barred from competing as an amateur. He kept on competing well as a pro for several years thereafter. 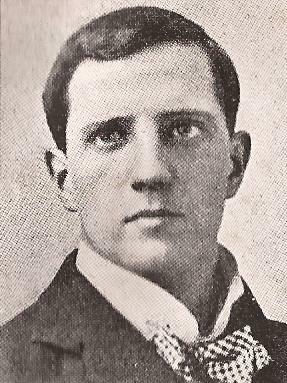 The result was that JK Barr who had been second to him in the two short sprints in 1895 won both from long jumper Hugh Barr who would go on to the sprint title himself before he ended his career. There wasn’t much between the meetings in terms of standards but it is of interest to note that Ross, throwing in the Union meeting threw the hammer only four inches less than JD McIntosh on the other side of the country. 100 yards: JK Ballantyne, H Barr. Reserve: T Scott. 220 yards: JK Ballantyne, H Barr. Reserve: T Scott. 440 yards: GC Thompson, W Pollock. Reserve: G Somerville. Half-Mile: H Welsh, W Hay. Reserve: TK Fair. Mile: H Welsh, J Stirton. Reserve: JF Hendry. Four Miles: RA Hay, FW Bruce, AR Gibb. Reserves: P McMorrow and L Jack. 120 yards hurdles: AR Timms, WB Taylor. Reserve: W Dove. Broad Jump: H Barr, WCS Taylor. High Jump: C Fenwick, W Grieve. Reserve: W Dove. Weight and Hammer: JD McIntosh, M McInnes. In the International on 18th July, Ireland won by 7 events to 4 with the Scots winners being Welsh in the 880 yards and mile, R Hay in the 4 miles and Hugh Barr in the Broad Jump. Barr was also second in the 100 and 220 yards races. By June 1897, the two bodies had come together under the SAAA banner and the championships that summer involved not only all amateur athletes in the country but also the cyclists of the SCU. The split was over.